The World Commission on Environ­ment and Development was initiated by the General Assembly of the United Nations in 1982, and its report, Our Com­mon Future, also named the “Brundtland Com­mission.” Its roots were in the 1972 Stockholm Conference on the Human Environment—where the con­flicts between environment and devel­opment were first acknowledged—and in the 1980 World Conservation Strat­egy of the International Union for the Conservation of Nature, which argued for conservation as a means to assist development and specifically for the sustainable development and utilization of species, ecosystems, and resources. Drawing on these, the Brundtland Com­mission began its work committed to the unity of environment and development. The Brundtland Commission’s brief definition of sustainable development as the “ability to make development sustain­able—to ensure that it meets the needs of the present without compromising the ability of future generations to meet their own needs”2. According to US EPA, their definition of sustainability calls for policies and strategies that meet society’s present needs without compromising the ability of future generations to meet their own needs. The 1970 National Environmental Policy Act (NEPA) formally established as a national goal the creation and maintenance of conditions under which humans and nature “can exist in productive harmony, and fulfill the social, economic and other requirements of present and future generations of Americans”. Common to both the public policy and business perspectives is recognition of the need to support a growing economy while reducing the social and economic costs of economic growth. Sustainable development can foster policies that integrate environmental, economic, and social values in decision making. From a business perspective, sustainable development favors an approach based on capturing system dynamics, building resilient and adaptive systems, anticipating and managing variability and risk, and earning a profit. Proponents believe that sustainable development reflects not the trade-off between business and the environment but the synergy between them. 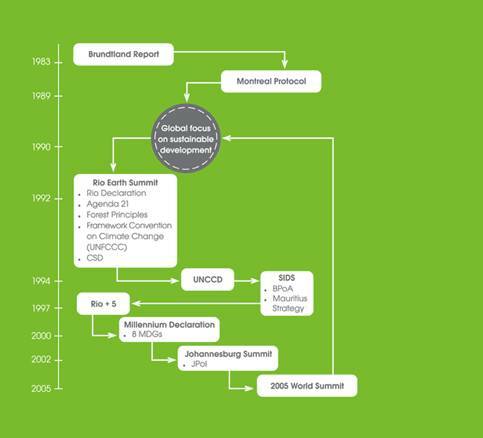 2012 Twenty years after the landmark UN agreement in Rio a review summit will be held in Brazil in 2012. The focus of Rio+20 will be on a green economy in the context of sustainable development and poverty eradication, says the UN4. Thus the concept of 'sustainable development' was launched: social and economic advance to assure human beings a healthy and productive life, but one that did not compromise the ability of future generations to meet their own needs. Sustainable development brought environmentalism into poverty reduction and poverty reduction into environmentalism in a single and simple formula. It led to the first Earth Summit - the UN Conference on Environment and Development - at Rio de Janeiro in 1992, and to the formulation of Agenda 21. Agenda 21 is a comprehensive plan of action to be taken globally, nationally and locally by organizations of the United Nations System, Governments, and Major Groups in every area in which humans impact on the environment. Agenda 21, the Rio Declaration on Environment and Development, and the Statement of Principles for the Sustainable Management of Forests were adopted by more than 178 Governments at the United Nations Conference on Environment and Development (UNCED, a.k.a. "the Earth Summit") held in Rio de Janerio, Brazil, 3 to 14 June 1992. This conference was held as a response to the Report of the World Commission on Environment and Development, Our Common Future ("the Brundtland Report"). As its name suggests, UNCED was not just a sequel to the 1972 Stockholm Conference on the Human Environment; it represented a concerted effort to synthesize and integrate environment and development issues. For the first time, the international community endorsed sustainable development, changing the prior approach to development, which called for peace and security, economic development, human rights and supportive national governance, by adding a fifth element, protection of the environment. • Commitment to increase access to modern energy services increase energy efficiency and to increase the use of renewable energy. • To phase out, where appropriate, energy subsidies. • Commitment that by 2020, chemicals should be used and produced in ways that do not harm human health and the environment. • To enhance cooperation to reduce air pollution. • To improve developing countries’ access to environmentally sound alternatives to ozone depleting chemicals by 2010. • Commitment to reverse the current trend in natural resource degradation. • Commitment to restore fisheries to their maximum sustainable yields by 2015. • Commitment to establish a representative network of marine protected areas by 2012. • Commitment to improve developing countries’ access to environmentally-sound alternatives to ozone depleting chemicals by 2010. • Undertake initiatives by 2004 to implement the Global Programme of Action for the Protection of the Marine Environment from Land Based Sources of Pollution. • Recognition that opening up access to markets is a key to development for many countries. • Support the phase out of all forms of export subsidies. • Commitment to establish a 10-year framework of programs on sustainable consumption and production. • Commitment to actively promote corporate responsibility and accountability. • Commitments to develop and strengthen a range of activities to improve natural disaster preparedness and response. ■Recognition of the serious challenge posed by climate change and a commitment to take action through the UN Framework Convention on Climate Change. Assistance will be provided to those most vulnerable, like small island developing states. ■Agreement to create a worldwide early warning system for all natural hazards. The Precautionary Principle has been included either specifically or by inference as part of numerous environmental statues around the world, including the United States. ■Since the release of Our Common Future, more than 70 competing definitions of sustainable development have been offered by academics and policy analysts5. ■How can we reasonably be expected to know, for instance, what the needs of people in 2100 might be? ■In the years following the Brundtland Commission’s report, the creative ambi­guity of the standard definition, while allowing a range of disparate groups to assemble under the sustainable devel­opment tent, also created a veritable industry of deciphering and advocat­ing what sustainable development really means6. ■Since the Brundtland Commission first defined sustainable development, dozens, if not hundreds, of scholars and practitioners have articulated and pro­moted their own alternative definition; yet a clear, fixed, and immutable mean­ing remains elusive. This has led some observers to call sustainable develop­ment an oxymoron: fundamentally con­tradictory and irreconcilable. Further, if anyone can redefine and reapply the term to fit their purposes, it becomes meaningless in practice, or worse, can be used to disguise or greenwash socially or environmentally destructive activities7. 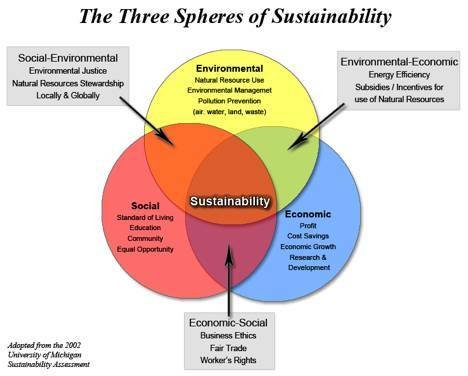 ■Still another way to define sustainable development is in how it is measured. Indeed, despite sustainable develop­ment’s creative ambiguity, the most seri­ous efforts to define it, albeit implicit in many cases, come in the form of indicators. Combining global, national, and local initiatives, there are literally hundreds of efforts to define appropri­ate indicators and to measure them8. ■ First, if economic growth were to be slowed or stopped—and sustainable development is essentially concerned with putting boundaries around economic growth—it would be impossible to improve environmental conditions around the world9. ■The bias toward central planning on the part of those endorsing the concept of sustainable development will serve only to make environmental protection more expensive; hence, society would be able to “purchase” less of it10. ■Strict pursuit of sustainable development, as many environmentalists mean it, would do violence to the welfare of future generations11. this trend will actually improve greatly over time and that resource depletion is simply not a significant worry if the correct legal and economic policies are maintained. Accordingly, “sustainable development”— even if we put aside its theoretical difficulties— is a solution in search of a problem12. ▪Who will decide what is good growth? ▪Who will reconcile competing environmental, social, and economic concerns while anticipating environmental problems rather than reacting to the crisis of the moment? ■Environmental planning would impose an incredible informational burden on government that is unlikely to be met in the real world14. command economies, appear as a comparatively unambitious exercise. Government “ecologically-minded” planners wishing to regulate a range of environmental outcomes would need the vast information on consumer tastes, production techniques, and resource availability required of a conventional central planner, information that is typically not available at any reasonable cost. They would need detailed information on myriad dynamically evolving and interacting ecosystems”15. ■One of the most serious threats to Sustainable Development is global instability. The civil unrest in Somalia and Ethiopia are examples of this situation17. ■At the 1992 Earth Summit The document that came out of the summit is not analytical but exhortative and practical. It does not explain the reasons behind the economic and environmental crises but offers solutions for them18. ■ The United Nations seems to be promoting a voluntary system spearheaded by the capitalist class. Furthermore, the document says that “Agenda 21 is a dynamic programme” that “will be carried out by the various actors according to the different situations, capacities and priorities of countries and regions” (United Nations Conference on Environment and Development, 1992, sec. 1.6). There is no benchmark, no firm commitment to action for the environment. Of course a UN commission cannot make sovereign nation-states comply with its resolutions, which may help explain the commission members ‘caution. And it is obvious that the United Nations, as a political body, has to allow for compromises among competing interests. But when it comes to promoting a free-trade and a pro-business agenda, the commission shows no sign of compromise19. ■In the UN document titled “Business Responsibility for Sustainable Development”, they suggest that another “co-regulatory” form of civil regulation is where NGO’s and trade unions have a greater influence in determining how business relates to society and the environment (meant for those businesses that do not fall into line with Sustainable Development). Civil regulation suggests an alternative mode of compliance, where business complies not only with national and international law, or with its own norms and standards (corporate self-regulation), but also with those determined to a large extent by civil society organizations.20 Perhaps a better way to suggest this to force a partnership with the “offending business”. ▪ Recognize interdependence. Simply put: everything you do personally, in your organization and through your work interacts with and depends upon the natural world, at every scale, both locally and across the globe. ▪ Eliminate the concept of waste. Are you considering the full, life-cycle consequences of what you create or buy? ■Insist on the right of humanity and nature to co-exist in a healthy, supportive, diverse and sustainable condition. ■Recognize interdependence. The elements of human design interact with and depend upon the natural world, with broad and diverse implications at every scale. Expand design considerations to recognize even distant effects. ■Respect relationships spirit and matter. Consider all aspects of human settlement, including community, dwelling, industry and trade, in terms of existing and evolving connections between spiritual and material consciousness. ■Accept responsiblility for the consequences of design decisions upon human well-being, the viability of natural systems and their right to co-exist. ■Create safe objects of long-term value. Do not burden future generations with requirements for maintenance or vigilant administration of potential dangers due to the careless creation of products, processes or standards. ■Eliminate the concept of waste. Evaluate and optimize the full life cycle of products and processes to approach the state of natural systems, in which there is no waste. ■Rely on natural energy flows. Human designs should, like the living world, derive their creative force from perpetual solar income. Incorporate this energy efficiently and safely for responsible use. ■Understand the limitation of design. No human creation lasts forever, and design does not solve all problems. Those who create and plan should practice humility in the face of nature. Treat nature as a model and mentor, not as an inconvenience to be evaded or controlled. ■Seek constant improvement by the sharing of knowledge. Encourage direct and open communication between colleagues, patrons, manufacturers and users to link long-term sustainable considerations with ethical responsibility and to reestablish the integral relationship between natural processes and human activity. The original document states: "The Hannover Principles should be seen as a living document committed to the transformation and growth in the understanding of our interdependence with nature, so that they may adapt as our knowledge of the world evolves.22"
■Economic development and jobs— that create employment and business opportunities, improves local tax base, provides neighborhood services and amenities, and creates economically competitive communities. ■Strong neighborhoods—that provide a range of housing options giving people the opportunity to choose housing that best suits them. Smart growth provides the choice to walk, ride a bike, take transit, or drive. It maintains and enhances the value of existing neighborhoods and creates a sense of community. ■Gridlock and air pollution will increase greatly as traffic congestion continues to mount, imposing costs on travelers and on consumers dependent on distribution of goods by truck24. ■The emphasis on expensive rail transit actually will reduce the quality of the current mass transit system as fare prices are raised and bus routes are curtailed to pay for rail lines25. ■Taxes will have to be increased (or urban services reduced) to pay for rail transit projects and subsidies to high-density housing28. ■Consumer costs will increase because of rising transportation costs from congestion and from the restrictions on new shopping areas29. ■Open space in valuable locations such as people’s backyards, urban parks, and golf courses will be transferred to less valuable locations such as private rural farms that are unavailable for recreation30. ■Smart growth advocates believe they know best how people should live. That belief seems destined to be discredited along with “urban renewal” policies and public housing projects31. ■The concept of Smart Growth is vague and loosely defined. ■Since the 1970s, San Francisco has created artificial land shortages by implementing regulatory barriers to construction, such as urban-growth boundaries, purchases of regional parks and open spaces, and various limits on building permits. ■But in addition to noting those benefits often aren’t realized, Cox argues smart growth policies inflict great economic damage. He says the current housing crisis was caused in no small part by smart growth policies and the effect of growth restrictions that artificially raised housing prices. "Smart Growth at the Federal Trough-EPA's Financing of the Anti-Sprawl Movement", Peter Samuel and Randal O'Toole-CATO Policy Analysis, November 24, 1999. "Why "Smart Growth" is "Not-Smart Economics"', Howard Baetjer-Institute for Research on the Economics of Taxation, September 2000. Building professionals and municipal planning officials each have numerous goals and try to satisfy many needs during land development. Private developers are interested in profitable business ventures that also effectively address environmental concerns and meet regulatory requirements. Public sector officials ensure that development projects mesh with applicable zoning ordinances and help improve the surrounding community. ■Low Impact Development methodology is traditionally more expensive to construct traditional storm water methods. ■With Low Impact Development, there is a much higher degree of maintenance time and expense associated with these devices to perform to their intended efficiency. An example of the added maintenance is that permeable pavement requires periodic high powered vacuuming of the pavement area to remove sediments39. ■Since most of the Low Impact Development technologies are relatively new, there is no history regarding performance in the long run. In addition, most of these technologies are relatively new and not widespread. These technologies remain relatively untested40. Leadership in Energy & Environmental Design (LEED) is an internationally recognized green building certification system, providing third-party verification that a building or community was designed and built using strategies intended to improve performance in metrics such as energy savings, water efficiency, CO2 emissions reduction, improved indoor environmental quality, and stewardship of resources and sensitivity to their impacts44. Developed by the U.S. Green Building Council (USGBC), LEED provides building owners and operators a concise framework for identifying and implementing practical and measurable green building design, construction, operations and maintenance solutions45. Back in 2007, the US Green Building Council adopted the Precautionary Principles as one of their six guiding principles. When Dr. Ted Schettler of SEHN was asked why the Precautionary Principle meshes with the green building movement, he stated “It seems to me that in critical respects the rationale for the green building movement parallels the rationale for the precautionary principle movement in science. Both movements present a head-on challenge to old assumptions upon which the status quo rests, for example, that humans are largely separate from the environment and that we largely understand and can control and shape natural systems to our ultimate benefit. Both are clear that ethics and values should be present and transparent in the role of science-based decisions and professional practice. Both weigh a responsibility to future generations in the balance of the judgments they make today. And both are challenged by defenders of the old order who trivialize these concerns as "unscientific" and "emotional." When Dr. Schettler was asked about the challenges of critics of the Precautionary Principle, he stated “Values and ethics are and have always been integral to good science. Proponents of the Precautionary Principle are explicit and transparent about the values we bring to the science and its application -- the importance of preventing harm, respect for the integrity of ecological systems that support life, and responsibility to this and future generations are among them. Critics of the Precautionary Principle often fail to state the values they seek to further with their method -- they foster the myth that science is value-free. In truth, science always includes value judgments, such as determining an appropriate threshold for declaring something to be proven when absolute certainty is unattainable. "Lack of proof" is often used as an excuse to postpone protective measures, without making it clear that "proof" is a concept with political and social as well as scientific dimensions. Scientists must also decide whether to favor false positive or false negative conclusions when analyzing data. "Safety" is not provable because you can't prove something will not happen, so any determination of "safety" is a value judgment, not an objective truth. Primary prevention is a basic principle of public health, and preventive measures often entail acting before cause and effect relationships are fully understood”46. Q: You can't prove anything is safe. A: It is possible to demonstrate that there are safer alternatives to an activity47. Another example how the Precautionary Principle is vague. ■The expensive of the LEED certification: Registration fees run from $750-3750. The certification of the building may run from $1500-7500, depending upon the size of the building. ■LEED does not guarantee energy efficiency. ■LEED does not take into account the sitting of the building. ■Some groups claim that the LEED system is burdensome and arbitrary. "The Hidden Risks of Green Buildings: Avoid Moisture and Mold Problems", J. Odom, Richard Scott, George DuBose.